In stock -This product will ship today if ordered within the next 14 hours and 28 minutes. 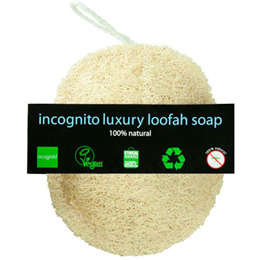 incognito Luxury Loofah Soap cleans and conditions your body making you significantly less attractive to biting insects in the process.A loofah has microscopic hairs that gently remove detritus from the skin pores when gently exfoliating. Conditions and polishes the skin. Removing the detritus helps reduce kairomones as it washes away the dead cells and other impurities skin bacteria feed on; emitting a strong attractant kairomone in the process. All ingredients are 100% natural. The loofah within the soap can be kept as an exfoliant once the soap has gone or used for a pan scourer instead of a green pad! Our luxury loofah soap with citronella, tamarind, turmeric & honey deep cleanses, conditions, polishes and softens the skin naturally. Stimulating blood circulation at skin level while freeing the pores of all impurities. The loofah soaps are also effective in supressing cellulite, removing calluses from the knees, ankles, palms and feet, as well as helping control both ingrown hair, body and foot odour. Use every other day massaging the skin in long stroking movements towards the heart. This helps boost circulation and promotes a general feeling of wellbeing. Below are reviews of incognito Luxury Loofah Soap - with Insect Repellent - 100g by bodykind customers. If you have tried this product we'd love to hear what you think so please leave a review. incognito Luxury Loofah Soap cleans and conditions your body making you significantly less attractive to biting insects in the process. A loofah has microscopic hairs that gently remove detritus from the skin pores when gently exfoliating.